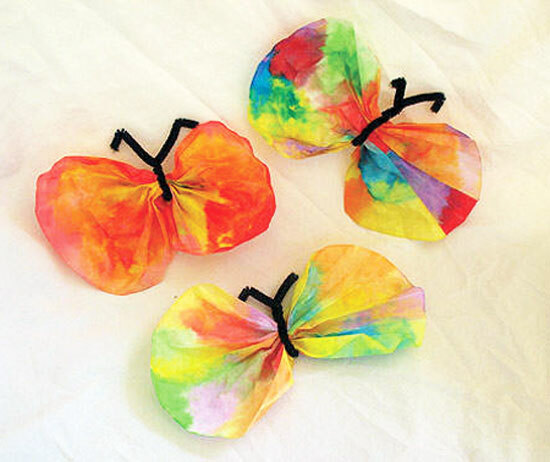 Here’s a fun kids craft for Spring that’s super easy. You probably have everything you need right at home too! 1. Flatten the coffee filter and place it on a plate or newspaper. 2. Using the water color paints, decorate the coffee filter. Let it dry. 3. Fold the coffee filter accordion style – an adult can help if needed. 4. Wrap the chenille stem around the center of the folded coffee filter. 5. Bend the tips of the chenille stems over to create the antennae. 6. Fan out the butterfly wings. 7. Hang in the window with string and watch your butterfly fly!